In ancient Rome, politics and family were inextricably linked. The incestuous nature ruling dynasty was embodied by the brief career of Germanicus. In ancient Rome, politics and family were inextricably linked. The incestuous nature of the ruling Julio-Claudian dynasty was well embodied by the brief but notable career of Germanicus, who rose to the heights of power, only to be cast down by his own blood kin. Germanicus was born in 15 bc, the son of Nero Claudius Drusus and Antonia Minor. His grandfathers were the noblest of Romans—Caesar Augustus and Marc Antony, respectively. Future emperor Claudius was his brother. He was a particular favorite of Augustus, who seriously considered naming him his successor before choosing Germanicus’s uncle, Tiberius, instead. In recompense, Augustus forced Tiberius to adopt Germanicus and name him his eventual heir to the throne. After the death of Augustus in 14 ad, the Roman Senate appointed Germanicus commander-in-chief of the imperial forces in Germania. He proved his loyalty to Tiberius by putting down a rebellion by the legions, who wanted Germanicus as their emperor instead. He subsequently led the legions to victory over the Cherusci and their allies, gaining sweet revenge for the horrific massacre of four Roman legions at Teutoburgerwald six years earlier. Germanicus’s victories did little to endear him to his uncle. Jealous, perhaps, of the younger man’s popularity with the army and the masses, Tiberius sent Germanicus into glorified exile at Antioch, Syria. 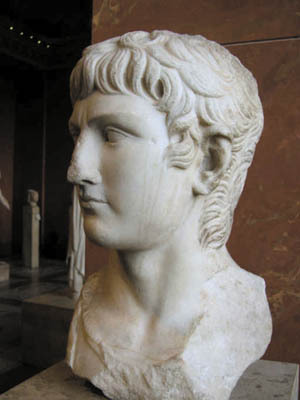 Germanicus further aggravated his uncle by paying an ill-advised visit to Egypt, where he was greeted warmly by the native populace as Marc Antony’s grandson. The provincial governor of Syria, Gnaeus Calpurnius Piso, was also jealous of Germanicus, who removed him from power and exiled him to an island off the coast of Syria. Germanicus died under suspicious circumstances in Antioch on October 10, 19 ad. It was rumored that his corpse bore the marks of poisoning—blue and black streaks, foaming at the mouth, and a heart that would not burn on the funeral pyre. Piso was suspected of foul play and brought back to Rome to face trial. He committed suicide before his likely conviction. It was widely believed that Tiberius had played a part in Germanicus’s death, if only from a distance. Whatever the case, Germanicus exacted a posthumous revenge. His son Gaius Julius Caesar Germanicus, nicknamed Caligula (Little Boots), became emperor in 37 ad, after Tiberius was smothered to death in his bed by the prefect of the Praetorian Guard. Caligula’s short four-year reign was filled with remarkable cruelty and sexual perversion, including incestuous relationships with all three of his sisters, one of whom was personally disemboweled by Caligula while pregnant with their child. Caligula eventually named himself a living god and appointed his favorite horse to a seat in the Senate. He forced the wives of prominent senators to work in a royal brothel and enjoyed recounting his amorous exploits to their husbands. The emperor also enjoyed watching executions while eating his supper. Once, when he could not find enough convicts to feed to the lions in the arena, he simply had innocent spectators thrown to the beasts. “Let them hate me, so long as they fear me,” he said of the Roman people. Caligula was assassinated in 41 ad by the same Praetorian Guard who had killed his predecessor. His wife and infant daughter were murdered along with him. Recent scholarship has tended to attribute Caligula’s insane cruelty to encephalitis or meningitis resulting from a serious illness he suffered shortly after ascending the throne. Whatever the cause, Caligula’s name has gone down in history as a virtual synonym for murderous capriciousness and the absolute corruption of absolute power. Tags Ancient Greece/Roman Empire, Antonia Minor, Caesar Augustus, Caligula, Germanicus, Gnaeus Calpurnius Piso, Julio-Claudian, Marc Antony, Nero Claudius, Praetorian Guard, roman empire, Rome, Tiberius.